The largest sixth-wicket stand in PSL history was spurred by the oldest player to score a T20 half-century as Misbah-Ul-Haq, playing his first match since February 15, rescued Peshawar Zalmi from a perilous position of 20 for 5 to complete a four-wicket win with a ball to spare. The win helped Zalmi clinch a playoff spot while Qalandars are on the brink of missing the knockout stages after the loss. Chasing 125, Misbah entered at 8 for 2 in the second over in the midst of a destructive spell by Shaheen Afridi. 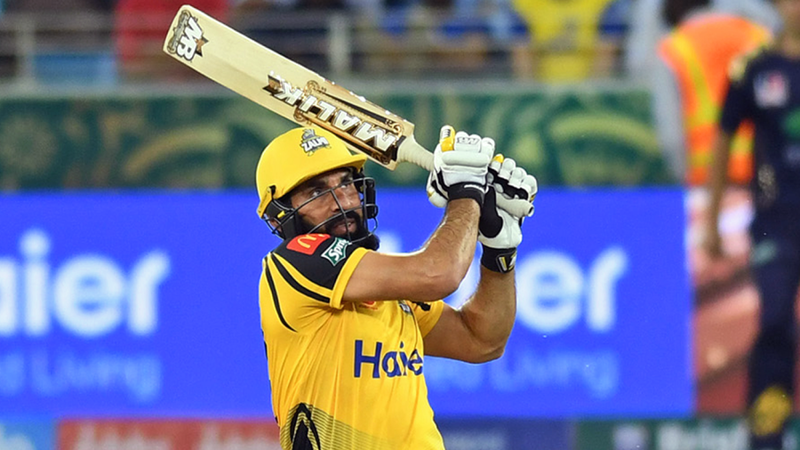 But with Zalmi in serious strife, Misbah was joined by another cagey veteran in Darren Sammy and the pair added an even 100 for the sixth wicket, taking the match into the final over before Sammy fell with four balls left. Qalandars had several chances in the final over to turn the tide their way, but Misbah was dropped at deep square leg on the first ball by Ryan ten Doeschate on 55 before a missed run-out led to overthrows to level the scores. A single by Wahab Riaz to short third man was fumbled to symbolically end the match. Playing his first match of the season, Tymal Mills bowled a superb spell for Zalmi, showcasing his array of slower balls and changes of pace to keep batsmen off balance. Mills got Anton Devcich miscuing a drive to mid-on in the second over of the match to get the ball rolling in the field before coming back in the 15th getting Haris Sohail uppercutting to third man for a top-score of 43. With the score 34 for 5 after 9 overs of the chase, Misbah slog swept Sandeep Lamichhane for a pair of sixes over midwicket to begin the 10th over, getting the Zalmi chase back on track. With 31 off 18 needed, Sammy drove Haris Rauf over mid off before a streaky edge led to a second four in the over. There was nothing streaky about the six he pulverized over cover to end the over, taking the equation down to 13 off 12. At 44 years and 281 days, Misbah showed he's still got something left in the tank. He now has 108 runs in the season in his two knocks without being dismissed. Fakhar Zaman's use of Sandeep Lamichhane. Fakhar got spooked too easily by Misbah's back-to-back sixes to start the 10th. Rather than back his champion legspinner to break a burgeoning stand - especially since Lamichhane had taken 4 for 10 two matches prior against joint first-place Quetta Gladiators - Lamichhane was taken out of the attack and didn't return until Ryan ten Doeschate left injured four balls into the 20th over. A single followed, and he ended with 22 for 0 in 2.1 overs. Zalmi are level with Quetta Gladiators on 12 points atop the PSL table, though Zalmi have a better net run rate. However, Gladiators have another game in hand and, if they win, will finish at the top of the league heading into the playoffs. Qalandars sit in fifth place, on six points, two behind both Islamabad United and Karachi Kings. On the plus side, one of the final two matches for Qalandars is against last-place Multan Sultans, giving them hope that they can sneak into fourth.